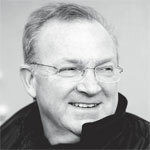 Martyn Brabbins is music director of English National Opera. An inspirational force in British music, Brabbins has had a busy opera career since his early days at the Kirov and more recently at La Scala, the Bayerische Staatsoper, and regularly in Lyon, Amsterdam, Frankfurt and Antwerp. He is a popular figure at the BBC Proms and with most of the leading British orchestras, and regularly visits top international orchestras such as the Royal Concertgebouw Orchestra, DSO Berlin and Tokyo Metropolitan Symphony Orchestra. Known for his advocacy of British composers, he has also conducted hundreds of world premières across the globe. He has recorded over 120 CDs to date, including prizewinning discs of operas by Korngold, Birtwistle and Harvey. He was associate principal conductor of the BBC Scottish Symphony Orchestra from 1994 until 2005, principal guest conductor of the Royal Flemish Philharmonic from 2009 until 2015, chief conductor of the Nagoya Philharmonic Orchestra from 2012 until 2016 and artistic director of the Cheltenham International Festival of Music from 2005 until 2007. He is currently visiting professor at the Royal College of Music and music director of the Huddersfield Choral Society.